Combine pinto beans and black beans in a colander; rinse with cold water and add to pasta. Add corn, tomatoes, cumin, chili powder, onion powder, garlic powder, dried red pepper flakes and salt and pepper to taste; toss lightly. This was very yummy!!! I used a bit less cumin and added some homemade salsa. Very good and VERY EASY to make! Was a MAJOR hit with the family. Has a Tex-Mex Southwestern flavor. Try adding chopped onion, salsa. Serve with tortilla chips. 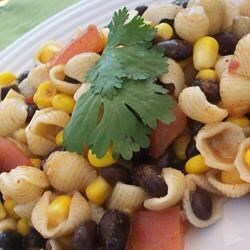 Great flavorful bean and pasta salad. I remove the chili powder as it does not agree with me and I use only 1 can of beans. The cumin is the catch to making it great!